I feel like our group has moved up to the next level of play and going into the next season, I will be looking to get an invite to Worlds. This means going to more tournaments and training harder but I'm up to the task and I am hoping to include the site in my journey. With much content, (keeping in mind my school causes me to have very little free time) I will be looking to write more articles about the TCG, relating to team Whimsy Tackle and our fantastic adventures throughout the 2012-2013 season. Please come join us on the journey. So since I did not qualify for Worlds this year, I have no reason to play in the HGSS-on format any longer. The format will be switching to only cards from the set Black & White and forward right after worlds and into the 2012-2013 season. It didn't take me long (about 15-20 minutes after losing in top cut) to start brainstorming deck ideas for the new format. 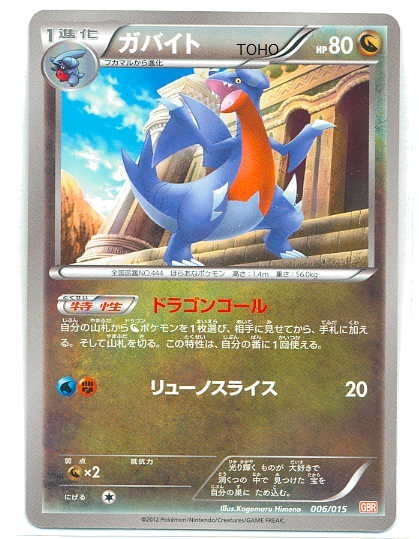 I remember sitting with Travis and saying, "Yupp, I'm gonna play Garchomp/Altaria," two cards that will be released in the upcoming set, Dragons Exalted. The deck has already won a Japanese World Qualifying tournament and apeared to be a strong choice to me. As soon as I got home I printed out proxies of the japanese cards along with those of another popular deck in the current Japanese metagame, Hydreigon/Dakrai EX. I sleeved them up and began to test. I started with Garchomp/Altaria and the first thing I noticed was it was ultra consistent. It set up extremely fast especially for it having a stage 2 as its main attacker. This was due in great part to Gabite, who's Ability lets you search your deck for a dragon type Pokémon and Emolga which for a single colorless energy lets you search your deck for two basic Pokémon and put them on your bench. I was extremely pleased with initial testing. Garchomp is good because it has 140 hp, which is pretty much a two hit ko for everything, low energy cost, which allows it to get around Mewtwo EX's X-ball attack, it is dragon type which hits Rayquaza, Rayquaza EX and Hydreigon for weakness, and it has low retreat cost. Almost forgot the best thing! It's not an EX! That means your opponent only takes one prize when he or she knocks it out. Altaria's ability makes every dragon type Pokémon's attacks deal 20 more damage and can be stacked. It has 70 hp and dragon type so it is searchable with Level Ball and with Gabite's Ability. It is a good, easy to set up card that supports Garchomp in taking prizes. Together those two make a great combination and will see play in America too. It was so good in fact that I almost decided to forget about Darkrai/Hydreigon and not even give the three headed beast a try. Well that would have been a big mistake. The new Hydreigon being released in Dragons Exalted has a very good ability too. It allows you to move around your Darkness energies freely on your Pokémon similar to Klinklang (the Pokémon that won 1st place Nationals) but its even stronger. Its attack deals 140 damage and because it moves dark energy, it benefits hugely from the energy acceleration of the trainer Dark Patch. Paired with Darkrai EX and Max potion, it can continually deny the opponent prizes and allow you to dominate the game. It will be a powerhouse here too, just as it is in Japan. This is a great time to get into the card game and with guidance, a great time to invest in cards that will last a long time. I hope I can help all at PKMNcast; new and old to the card game. A special thanks to Will and Chris for letting me stay with them in Indianapolis. I hope to write another article after I get back from San Fransisco!